Jack Swagger versus Bobby Lashley, anyone? 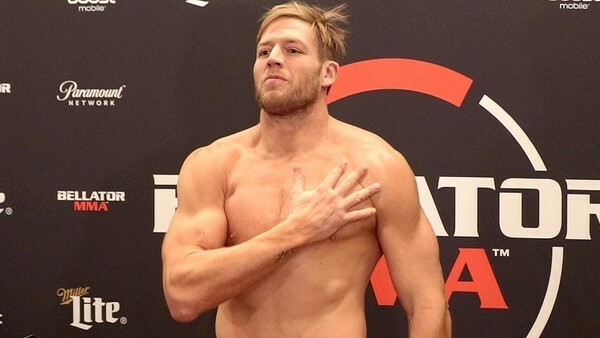 Jake Hager spent several years in World Wrestling Entertainment performing under the ring name 'Jack Swagger.' However, these days Hager is forging a new path in the sport of mixed martial arts. This past January, the 6'5" native of Perry, Oklahoma showcased his impressive amateur wrestling skills in his Bellator MMA debut. The former WWE Superstar managed to make quick work of his opponent, J.W. Kiser — winning the bout via arm-triangle choke in the very 1st round. Though his fight with Kiser was just a few short weeks ago, fans are already eager to see what the future has in store for the former WWE World Heavyweight Champion. Being that Hager is a newcomer to the sport, Bellator will likely have him face other inexperienced fighters in the early going. Of course, assuming all goes well, the former NCAA Division I All-American wrestler should get chance to take on some very big-name opponents before it's all said and done.